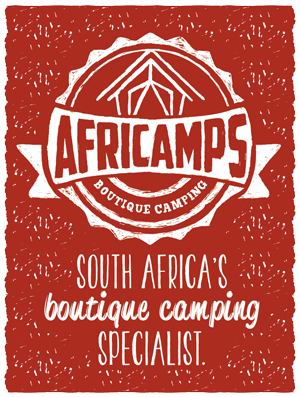 We are very excited to announce that our 8th AfriCamps location has opened right in the heart of the Cape Winelands! AfriCamps at Doolhof in Wellington opened on 14 December 2018 we happy glampers have been making memories ever since. Visitors from around the world return to South Africa time and time again to visit their favourite holiday destination, the Cape Winelands, but many may not know that Wellington is at the heart of it. 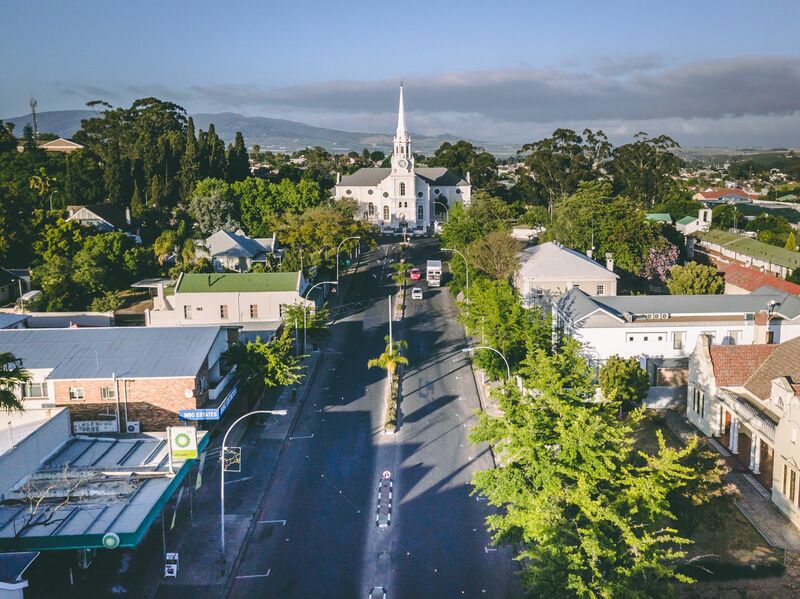 Quieter and less explored than its busy and touristy siblings Paarl, Stellenbosch and Franschhoek, Wellington makes the perfect Cape Winelands escape. Within an hour’s drive from Cape Town, at the foot of the Groenberg Mountain you will find this friendly town. Renowned for beautiful Cape Dutch homesteads, its picturesque environment, gardens and wineries, Wellington will instantly creep into your heart with its small-town charm. 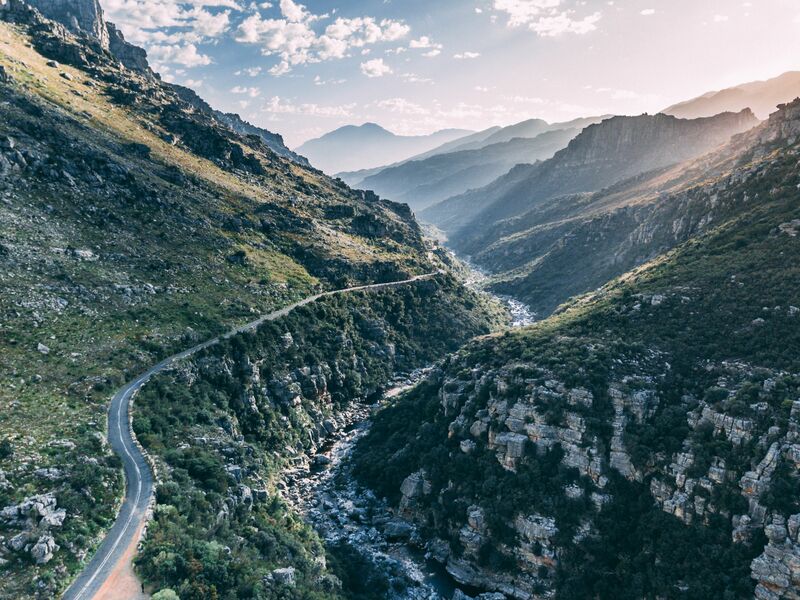 Capetonians frequently visit the area for the historical Bain’s Kloof Pass’ breathtaking views, indigenous flora and fauna, hiking trails among crystal-clear rivers, and mountain biking – an adventure seeker’s dream destination. Closer to town, you will find a number of idyllic wine farms. Do not, we repeat, DO NOT pass by the opportunity to explore Wellington’s wine route. It is, afterall, the ‘hometown’ of most South African wines, seeing as 85% of the country’s root stock or ‘stokkies’ (the original stems of our vineyards) come from Wellington! Wellington is undoubtedly the perfect weekend destination for couples, families or friends alike, but now the question is: What can you do with 72 hours in Wellington? Truth is, there are way more activities, restaurants and wineries in Wellington than can fit into 72 hours. And best of all, Wellington still has that undiscovered, undisturbed charm which means an authentic Cape Winelands experience awaits. Firstly, accommodation. 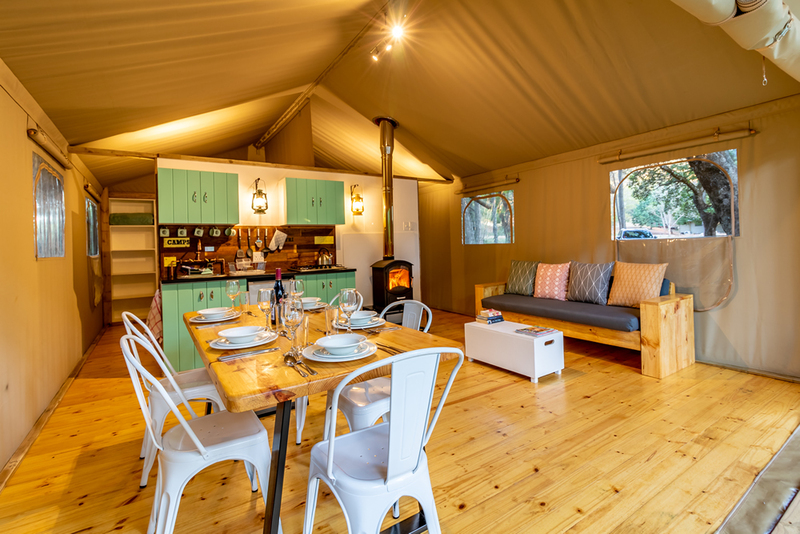 Pack your bags, because you’ll be staying at AfriCamps at Doolhof, the first glamping accommodation you’ll find in the entire Cape Winelands. Check in any time from 14:00 into your two-bedroom, 5-sleeper boutique tent complete with a fully-equipped kitchen, lounge and dining area, private bathroom, indoor fireplace, air conditioning and spacious deck with a large braai. You’ll be surrounded by vineyards on the one side, the Kromme River on the other side, and mountain views all around. Quick, book here! AfriCamps at Doolhof is set within the award-winning Doolhof Wine Estate, a short drive from the picturesque town of Wellington and at the end of Bovlei Road, a well-known area for mountain biking and wine tasting. After your drive past numerous wine farms, you’ll probably be in the mood for some wine, right? Doolhof’s wine tasting room is situated in an original wagon house built in the late 19th century. Unwind with an award-winning red paired with a platter while the kids explore the property with its cows, horses and labyrinth. Still in the mood to relax after some delicious wines? We understand! 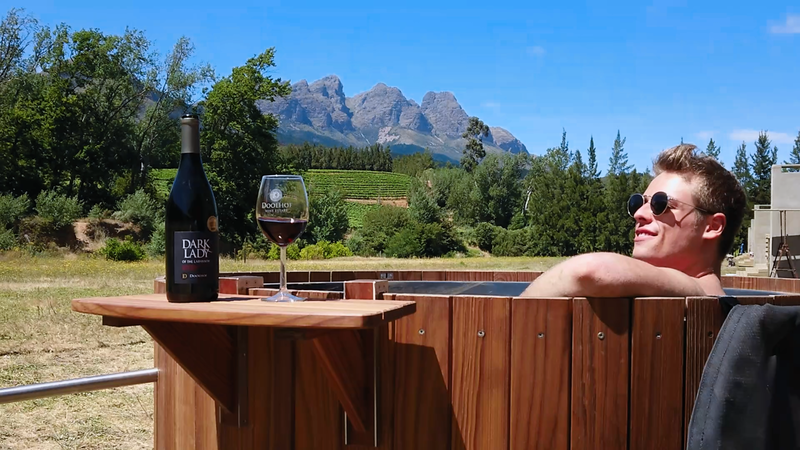 Why don’t you buy a bottle of wine at The Tasting Room, sip and soak in our brand new hot tubs? Yes, you read it right, we’ve added hot tubs to all AfriCamps at Doolhof tents – included in your rate! These tubs will be filled with water from our mountains via our farm dam. Simply start the fire in the coil with your starter pack of blue gum wood, leave the lid on and let the brilliant design do the work. Keep stirring the water to spead the heat evenly, give it about an hour to get very warm, get in and relax! Time to light the fire for an original South African Braai at your tent to kick start your weekend in true glamping style. AfriCamps at Doolhof provides braai packs with something delicious for the whole family. End off your first night by star gazing, braaiing marshmallows and telling stories around the fire. Rise and shine – it’s your second day in Wellington! Start off your day with some adventure – one of the things Wellington is famous for. Whether you prefer mountain biking or hiking trails, Wellington is your playground. If the Cape Epic Cycle Tour makes its way onto Doolhof – you know it’s gotta be good mountain biking terrain. From professional riders to kids going for their first big ride will find a trail that is suitable. Bring your own, or rent bikes right here on the farm. Don’t forget to get your Wild Boar Trail map from the Doolhof tasting room! Potbelly kids ride: This route starts and finishes at Val Du Charron where beginners can experience the 3.3km trail through vineyards and flat roads. Cross country: This route starts and ends at Doolhof Wine Estate. The route is 4.3km long for intermediate to advanced mountain bikers. Flat Hog: This 42km trail is for beginners to intermediate riders. The trail will take 1.5 – 3 hours and will take you through beautiful open gravel roads and small sections of jeep track. Scout loop: The Scout Loop is a beautiful trail for intermediate to advanced riders with an ascent of 928m. The trail is 20.5km long and takes 1-3 hours. Wild Boar: This 42.3km trail has an ascent of 1495m. It is loved by intermediate to advanced riders. Warthog: The Warthog trail is 36.3km long and will take 2.5 – 5 hours of your time. It will take you to a high top with an ascent of 1229m. Porcupine: The Porcupine Loop is a short ride for adventurous intermediate riders and will take 1.5 – 3 hours. Hedgehog: The Hedgehog Loop is 16.4km trail with a 679m ascent and fit for intermediate riders. Not big on cycling? There is also enough to discover on the property! Meandering through the estate is the picturesque Kromme River. There is no better way to start your day than with a walk along the tranquil river. Follow the path and stop for a picnic along the way. For a longer walk, you can also enjoy a 5km hike through the vineyards which also starts at Doolhof. The farm is known for its mysterious hills and valleys, and is also home to many small mammals, including buck, porcupine, baboons and even the shy leopard. During these walks, you don’t have to stress about making sandwiches on your way. Just order one of the delicious picnic baskets at Doolhof, these baskets are available upon prior reservation. For the less adventurous, take in the beautiful Cape Winelands surroundings without breaking a sweat. Head to Langkloof Roses where you can spend the morning enjoying cakes and bakes, tea and scones, cheese and preserves among the freshly cut blooms. Take a stroll on the beautiful rose-covered property before heading on to your next stop. After brunch, explore the variety of wine farms and distilleries in the area. Taste delicious wines on award-winning wine estates like Dunstone, Val du Charron, Welvanpas or Bosman, many of which offer country-style lunches and snacks. Taste world-class organic Brandy, Grappa, Port and Cabernet Sauvignon from Upland Organic Wine & Brandy Estate or take a distillery tour at James Sedgwick Distillery where grain and malt whiskies are distilled. Move on to Bontebok Ridge Reserve where you can take guided game drives spotting species such as Bontebok (found exclusively in the Cape), Eland, Zebra from the Quagga Breeding Project, Wildebeest, Springbuck, Duiker, Grysbok, Grey Rhebok, Sable Antelope, Gemsbock. The guide has remarkable knowledge of the area and its wonderful biodiversity. Booking essential. When night falls, head back to Bovlei Road for a family-friendly dinner at The Stone Kitchen, a popular family bistro on Dunstone Country Estate. The Stone Kitchen offers classic home-style dishes to enjoy with their selection of cellar wines. The Shiraz, Merlot and special Rosé come highly recommended. Kids will love the indoor and outdoor play areas. The Stone kitchen is also a great lunch spot. Start your final day in the Cape Winelands with AfriCamps’ delicious cook-your-own breakfast basket brought to your tent in the morning. Cook locally sourced produce and enjoy it on the spacious deck. Check-out time is at 10:00, leaving plenty of time to keep exploring the beautiful town. For the historians among us, the Wellington Museum features not only the cultures, artefacts, traditional tools, musical instruments and jewellery of various African ethnic groups but also prides itself in having ties with countries as far afield as America, England, Scotland, France and the Netherlands. It exhibits Stone-Age artefacts, a major collection of Egyptian artefacts and tells the stories of various pioneers who made their mark on the history of South Africa. Visit the Museum and discover the age-old mysteries of Africa. A final family friendly activity is Quenti’s alpaca farm. Take a look in the mill and see how alpaca fibre is processed into beautiful scarfs, socks and rugs. Head to Oude Wellington for their 3-course Sunday lunch. Friendly staff, tasty wines and hearty South African meals await! Take one last detour. If you came from Cape Town you missed out on driving through the world-famous Bainskloof Pass. We strongly suggest you make the trip before heading home. Today, the 26km Bainskloof Pass is recognised as a national monument and makes for a beautiful drive with stunning views over the Boland. The perfect end to a Cape Winelands glamping getaway weekend in Wellington!